Because children excel at anthropomorphizing the robots, kids who can’t physically be in school get the full educational experience–the good and the bad. For a kid, taking endless months off school sounds like a dream, even if you have to be sick to do it, but the reality is of course much different. For a kid, school is pretty much their whole life. Not only do they spend many of their waking hours in class, they also spend the rest of their social time with school friends. Chronic illness, which forces them to stay at home, is disastrous. “Every year, large numbers of K-12 students are not able to go to school due to illness, which has negative academic, social and medical consequences,” says Veronica Newhart, Ph. D student at UC Irving, and co-author of a new paper on how telepresence robots can let sick kids stay in school, even while they are cooped up at home. Thanks to medical advances, diseases once considered fatal–cancer, heart and kidney diseases–are now considered chronic, which means that they will last three months or more, and probably require the kid to stay away from school. 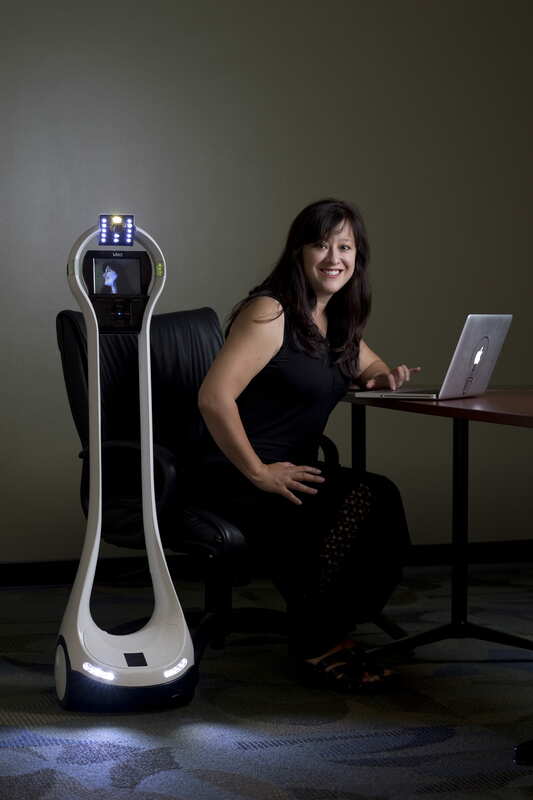 Telepresence robots let kids virtually attend class. These robots are wheeled devices topped with a screen and a camera, and an internet connection lets the kid see and hear everything in the classroom. Crucially, it also lets them maintain the social ties that would wither if they were to be tutored at home. Kids can chat with friends, and in class they can “raise a hand” via flashing lights. These automatons are already available and in use in U.S. schools, but their effect isn’t yet well understood. Studies have been done into the effects of social networks, texting, and email on social inclusion, but until now nobody has looked at telepresence robots. The new study, from Newhart and Mark Warschauer of UCI looks at virtual inclusion. It used a school system where five robots were already in use, but which were distributed “regardless of income level, family background, or social supports.” Often these robots are used only by kids from wealthier families, so the schools were picked to offer a wider range. The robot pretty much “became” the kid controlling it. In all cases, kids addressed the robot by its operator’s name. The UCI study found the same thing. “Anthropomorphism of the robot was a key contributor to establishing a sense of normalcy for all homebound students interviewed,” write the authors. Most schools reported an initial phase of excitement, followed by acceptance–the robot pretty much “became” the kid controlling it. In all cases, kids addressed the robot by its operator’s name. After attending school for several weeks as a robot, Samuel was cleared by his physician to attend school for picture day as long as he wore a facemask while not being photographed. He was able to finally meet his new friends in person and his teacher reported that Samuel and his friends got along just like they did when Samuel was in class via the robot. His classmates so easily accepted Samuel in person that when it came time to take the class picture, they did not want the robot in the picture. In only one case was the robot not treated like a normal student. Or rather, while the teachers and the other kids felt a connection, the operator of the robot “did not feel her classmates treated the robot as a ‘normal’ student.” Interestingly, the subject, Eileen, was the only female in the test, and also the only high-school student. Previous studies, say the authors, “have shown that user gender affects people’s reactions toward artificial intelligence robots.” In this case, though, the setup of high school, where Eileen had to attend different classes with different students, may have had an effect. Younger kids tend to attend classes in the same groups, and time spent together may strengthen their bond with the robot. Being treated just like any other kid meant that the robots sometimes got bullied, too. Eileen decided to give back her robot and resume home schooling after one kid called her a “vacuum cleaner,” but for Samuel, things got a lot worse. He experienced “negative verbal behavior” on several occasions, and even physical bullying. This happened–where else?–in the lunch room. Samuel also managed to ignore it, even when a bully named Mike would put his hand over Samuel’s camera to stop him seeing. In the end, Samuel’s friends would guard him during lunch, protecting the robot from the other kids. The bullying shows just how well-accepted the telepresence robots can become. They are so well assimilated that the sick kids at home can “enjoy” the full school experience, good and bad. There were frustrations, though. Samuel wished he could open doors to better get around and join other kids. And Nathan, another robot-operating kid, experienced multiple technical issues which severed his connection to the class, and to his friends. As a kid, I always wished I could have a duplicate of myself, a robot to send to school while I did more interesting things. But it seems that the most important aspect of schoolwork many kids is the social one, and that’s what these telepresence robots enable. In fact, the worst part of home-tutoring sick kids is probably the disconnection they experience. The robots in these trials were all provided either by wealthy parents, or by fundraising, and even though the study only followed five children, it seems clear that the benefits are very real. And if the kids do get bored in class, they could just cut the connection, or mute their mic and switch on the TV instead. Try doing that if your physical body is still in school.